Feature: TPR gel, which Tsung Hua uses, has even better stretch ability and softness, so that TPR can resist tremendous twist and friction while walking. 1. Shack-absorbed: according to the test of gel, the face of gel will disperse the pressure to absorb shocks. 2. Pressure-reduced: the heels will sustain two thirds of body weight, the gel can reduces the spinal pressure and prevent waists while walking. 3. Stop slipping: the gel is liquid that will be changed follow external force, and the adhesion is better, so it will prevent slipping. 5. Suitable for sports shoes, walking shoes, leather shoes. 6. 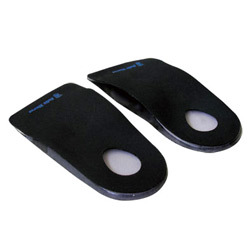 Half gel insoles for pressure reduction, orthotics insoles, healthy insoles. 7. Gel insole / gel foot health care product. 1. Specification: (1) Size: free. (2) Color: black. (3) Contents: gel: TPR100%. 2. For: (1) People who stand for long time (ex: Salespeople, operator). (2) People who have the problem of pain on heel. (3) Daily care of foot.